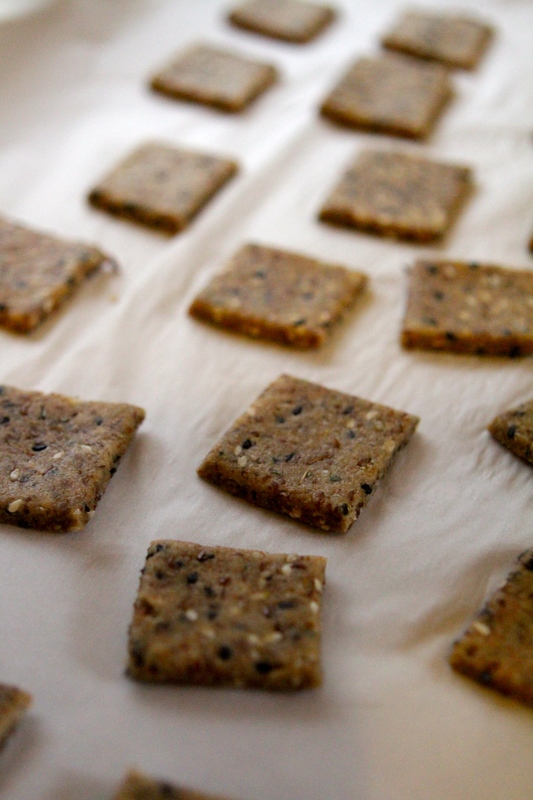 These little gluten free crackers are super versatile and surprisingly easy to make. A combination of brown rice and almond flour are flecked with sesame seeds, fresh herbs, nutritional yeast and sea salt for a cracker that can stand alone or be eaten with virtually any dip or topping. If you can find dulse flakes at your local grocery store, throw some of those in for some added mineral content and depth of flavor. These crackers contain more fiber, protein and healthy fat than your typical boxed crackers and deliver way more flavor. Plus, you can add them to your repertoire of “party tricks” to impress your friends…pretty much a win, win situation in my book. Note: I have sage, rosemary and thyme growing in my garden at virtually all times. You can substitute the same quantity of any fresh herb you choose, OR use 1/2 the amount of dried herbs if you don’t have access to fresh! In a large bowl, mix together all dry ingredients. Add wet ingredients and mix well until incorporated. Knead by hand until you can easily shape the dough into a ball with little to no crumbling. Shape the dough into a ball and place between two sheets of parchment paper. Roll out to 1/8th of an inch thickness using a rolling pin…or a wine bottle, like I do. Using a pizza slicer or sharp knife, slice into 1 inch squares. This recipe also works well with cookie cutters for a little extra fun. Bake for 16-18 minutes until golden brown. Allow to cool and store in an airtight container, if they last that long!